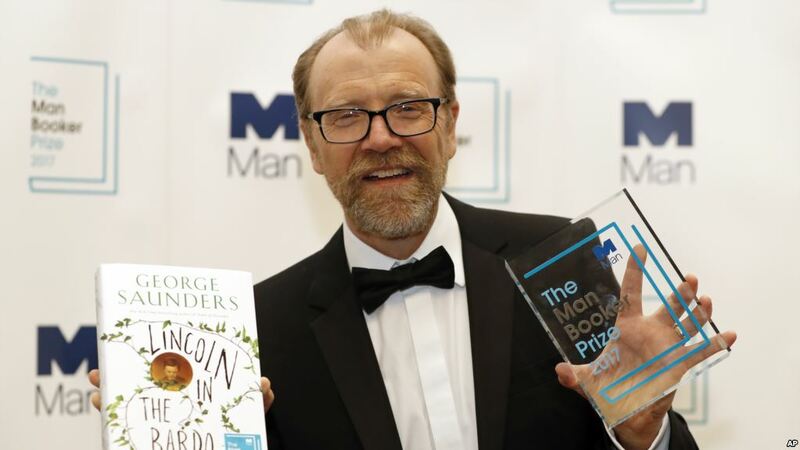 LONDON: American author George Saunders won the prestigious Man Booker Prize for fiction Tuesday for “Lincoln in the Bardo,” a polyphonic symphony of a novel about restless souls adrift in the afterlife. “I feel kind of numb,” said Saunders, who said disbelief and gratitude were his principal emotions on winning. The book is based on a real visit President Abraham Lincoln made in 1862 to the body of his 11-year-old son Willie at a Washington cemetery. By turns witty, bawdy, poetic and unsettling, “Lincoln in the Bardo” juxtaposes events from Lincoln’s life and the U.S. Civil War — through passages from historians both real and fictional — with a chorus of otherworldly characters who are dead, but unwilling or unable to let go of life. Saunders was awarded the prize by Prince Charles’ wife, Camilla, Duchess of Cornwall, during a ceremony at London’s medieval Guildhall. The author said he resisted telling the story of Lincoln, an American icon, for 20 years. But the novel, which took four years to write, turned out to be pointedly timely in a divided United States. “He underwent I think a kind of spiritual growth spurt that we don’t see very often,” outgrowing the “lazy, racist attitudes” he was raised with, the author told reporters. “His compassion and his heart kept growing out even as his own life was becoming more and more difficult,” Saunders said. A former oil industry engineer who teaches creative writing at Syracuse University in New York state, Saunders is probably best known outside literary circles for a commencement speech he gave in 2013 with the key message “Try to be kinder.” It went viral on the Internet, became an animated cartoon and was published as a book. He had been bookies’ favourite to win the Man Booker, which usually brings the winning novelist a huge boost in sales and profile. Saunders beat five other finalists: New Yorker Paul Auster’s quadruple coming-of-age story “4321”; U.S. writer Emily Fridlund’s story of a Midwest teenager, “History of Wolves”; Scottish author Ali Smith’s Brexit-themed “Autumn”; British-Pakistani novelist Mohsin Hamid’s migration story “Exit West”; and British writer Fiona Mozley’s debut novel “Elmet” about a fiercely independent family under threat.